Francis W Reichelderfer (1895-1983) was appointed Chief of the US Weather Bureau in December 1938 and was in office when the bureau was transferred to the Department of Commerce. He would serve in office for 25 years until retiring in 1963. Over these years he was responsible for bringing the Weather Bureau into a progressive new age. He also helped found and was the first head of the WMO when it was created in 1951. Educated as a chemical engineer, he started his meteorological career in the US Navy during World War I. After the war, he was the meteorologist for the the first transatlantic flight of an airplane, the Navy's NC-4 seaplane, in May 1919. He was an experienced aviator, and served as Chief of Naval Aerology (i.e., meteorology) from 1922 to 1928, working in the Weather Bureau building. In 1931 the Navy sent him to Bergen, Norway to study Bjerknes' theory of fronts and air masses. After this Reichelderfer was assigned to the dirigible service (he was weather officer for the dirigible Los Angeles at Lakehurst, New Jersey). Later he served as executive officer aboard the battleship USS Utah. In 1938 he retired from the Navy to become Chief of the Weather Bureau. His background in aviation and familiarity with the Norwegian cyclone model were key to his appointment. He appointed Carl Gustav Rossby, prominent Swedish meteorologist, academic, and friend, as his assistant chief. Reichelderfer led the Weather Bureau during World War II, which was responsible for training hundreds of meteorologists and for bringing the first women into meteorology. He served on the Joint Committee on Meteorology with Navy and Army chiefs. He promoted the involvement of universities in offering programs in forecasting as well as meteorological physics. Before this, forecasting was something learned by apprenticeship. Reichelderfer was an early proponent of the use of radar in meteorology and he asked R A Watson-Watt, the British inventor of radar, to introduce its use in the Weather Bureau. In 1942 the US Navy gave the Weather Bureau 25 surplus AN/APS-2F aircraft radars, an S-band radar, to be modified for ground meteorological use. The AN/APS-2Fs were modified by the Weather Bureau and called WSR-1s, -1As, -3s, AND -4s. The first WSR-1 was installed at Washington National (now Reagan National) Airport in March 1947. 82 of these units were operational by 1975. Some were still in service in 1980 when they were being replaced by the WSR-74C. ​​ ​In 1953, hook echos were first photographed on a Weather Bureau radar screen and were associated with tornado formation. However the Weather Bureau at the time did not accept responsibility for severe weather forecasting, such as tornadoes and severe thunderstorms. In 1954 the US Air Force introduced the AN/CPS-9 radar, the first radar specifically designed for meteorological use. 56 CPS-9s would be produced and they remained in service at military bases until 1984. The CPS-9 was an X-Band radar in the vicinity of 10 GHz. It represented a step forward in meteorological radar, but the observational data was not generally made available to civilian users. In June 1959, the Weather Bureau installed it's second-generation radar, known as the WSR-57, at the Miami Hurricane Forecast Center. It was also an S band radar (2890 MHz) and provided only coarse reflectivity data and no velocity data. The manufacturer was Raytheon, the developer of the AN/CPS-9. 31 of the WSR-57s were ordered in 1958. 14 of them were installed on the Atlantic and Gulf coasts for hurricane detection, and 11 were installed in the Midwest for local severe storm detection. Widespread implementation of the WSR-57 contributed to the establishment of the National Severe Storms Center in Kansas City in 1961, with the Weather Bureau taking full responsibility for severe storm forecasting. Eventually 66 WSR-57s were installed. The last WSR-57 was decommissioned in December 1996. The idea of numerical weather forecasting was first proposed in 1904 by Vilhelm Bjerknes of Norway. The first application of numerical forecasting by manual calculation was in 1922 by Lewis Fry Richardson in the UK. However the weather data reduction and computational methods available at the time were inadequate for the task, as it took 6 weeks to produce a 6 hour forecast. However the development of electronic computers in the 1940s, intended for problems of ballistics and code-breaking, suggested that computer numerical forecasting might be practical. In May 1946 a proposal was submitted to the Naval Office of Research and Invention by the Institute for Advanced Study at Princeton University to apply electronic computers to weather forecasting. Reichelderfer, John von Neumann, and C G Rossby were all involved in initiating this proposal but their exact roles are not precisely ​known. In 1957 an IBM 704 vacuum tube computer with 4k of 36-bit word, magnetic core memory and floating point arithmetic was installed. Forecasting results with the three level model were not satisfactory and in 1958 the JNWPU reverted to a single level model. This was successful and produced results useful to forecasters. The 704 was used until 1960 when an IBM 7090 computer was installed. The 7090 was IBM's first commercial transistorized scientific computer, with over 50,000 germanium transistors. By 1959, computer-plotted forecast maps were being sent out on the new National Facsimile Circuit. By about 1960, the computer products exceeded the quality of manually produced products. By 1970, about 500 weather charts were being faxed out daily. In 1961 the JNWPU was broken up into its separate Weather Bureau, Air Force, and Navy components. The Weather Bureau component was called the National Meteorological Center (NMC) in Suitland, Maryland. In 1962 the NMC upgraded to an IBM 7094 computer, which was backward-compatible with the 7090. It introduced double-precision floating-point arithmetic and allowed a return to a 3 level baroclinic model. A lower-cost IBM 1401 computer was used to transfer data from punched cards to magnetic tape to free the 7094 from slow card reading and printing tasks. 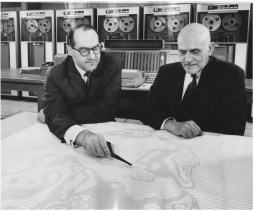 In 1966 a faster CDC 6600 computer was installed, and a 6 level baroclinic model was used. The 6600 utilized separate processors for tasks such as memory access and input/output, allowing the CPU to operate at the then-record speed of 10 MHz. Also the CPU was capable of parallel instruction processing and had instruction cache memory. The first global forecast model was run in June, 1966. Solar radiation effects were added to the forecast model in 1967, and moisture effects and latent heat were added in 1968. The 6600 would remain the Weather Bureau's primary forecast computer until 1973, when an IBM 360/195 was installed. The White Sands Missile Range was established in New Mexico in 1945 in order to test captured German V-2 missiles and later American ballistic missiles. Reichelderfer was impressed by photography from ballistic missiles launched at White Sands, which hinted at the usefulness of space-based meteorological instrumentation. 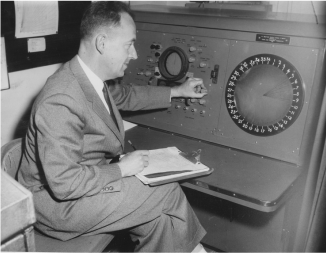 In 1958 Reichelderfer created the Weather Bureau's Meteorological Satellite Laboratory (MSL) to provide meteorological inputs to NASA's weather satellite program. In February 1959 the US Navy launched the Vanguard 2 satellite into medium earth orbit to measure cloud cover distribution for 19 days and the density of the atmosphere. Vanguard 2 was only partially successful due to spin stabilization problems and is still in orbit, with an expected orbital life of 300 years. 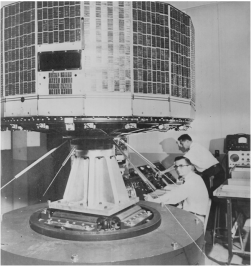 The first successful satellite dedicated entirely to meteorology was TIROS I, launched into low earth polar orbit by NASA in April 1960. TIROS stands for Television and Infrared Observational Satellite. The purpose of the TIROS program was to test the feasibility of still-picture television photography from orbit and the use of infrared instrumentation to measure the solar energy absorbed, reflected, and emitted by the earth. The satellite pictures were photographed from a television screen at the ground station for distribution until TIROS VIII, which introduced facsimile transmission of the photos. TIROS was a co-production of NASA, the US Army, the US Navy, RCA, and the Weather Bureau. Although TIROS I only operated for 79 days, it relayed thousands of pictures to earth and was highly successful. TIROS II, which continued the program, was launched in November 1960 and was also successful. TIROS III was launched in July 1961 and provided valuable coverage of the 1961 Atlantic hurricane season, including Hurricane Carla. The program continued through TIROS-10 in 1965, with all of these launched in east-west orbit from Cape Canaveral, Florida. In parallel with the TIROS program, NASA tested remote sensing of the atmosphere with the NIMBUS series of experimental satellites, sharing the results with the Weather Service. Seven NIMBUS satellites were successfully launched between 1964 and 1978. One was a launch failure. The NIMBUS satellites used the Automatic Picture Transmission (APT) system, which transmitted facsimile pictures to local weather data users as well NASA ground stations. As of 1965, 60 receiving stations were in use around the world. Each NIMBUS satellite had a unique array of experiments that laid the groundwork for later operational satellites. They were the first satellites to provide nighttime cloud photographs using infrared photography. All were launched from Vandenburg Air Force Base into polar orbit. The last, NIMBUS 7, continued to operate until 1994. Reichelderfer retired in 1963 and was succeeded by Robert M White as Chief of the US Weather Bureau. He served in that post from 1963 to 1965, when the Department of Commerce was reorganized and the US Weather Bureau was included as part of the new Environmental Science Services Administration (ESSA). White served as the first and only Administrator of ESSA from 1965 to 1970, when the Department of Commerce was again reorganized and the US Weather Bureau became the National Weather Service under the National Oceanic and Atmospheric Administration (NOAA). White served as the first Administrator of NOAA from 1970 to 1977. White's brother, Theodore H White, is an author famous for his "Making of the President" series of books. ESSA was conceived to organize meteorological, climatological, hydrographic, and geodesic operations under one organization. It was the first US government organization with the word environment in it's name. The US Weather Bureau continued its existance but was under ESSA. The TIROS satellite program was continued under ESSA as the more advanced TIROS Operational System program (TOS). Satellites ESSA-1 through ESSA-9 were launched and transmitted daytime cloud photography to ground stations between 1966 and 1969. ESSA-1, -2, and -9 were launched from Cape Canaveral while the others were launched from Vandenburg Air Force Base in California. ESSA-8 continued in operation until 1976. The TIROS family of satellites continued to be launched into the NOAA years as the TIROS-N and NOAA-1 through NOAA-19 (launched in 2009) polar orbiting satellites, while geosynchronous weather satellites were developed under NOAA.